I’ve been asked several hundred times in my life why my name was chosen? When I was born fall was just starting to approach and my parents looked outside and loved the weather and decided my first name should be Autumn. My middle name was already chosen, Marie. Marie is a form of Maria which many of my Dutch relatives have as a middle name including my Grandma. Do you choose a name because a family member has it? Do you choose a name because of a scene played out in your life? Do you choose a name based on the Bible? Do you choose a name because of popularity? Do you choose a name because it’s unique? Do you choose a name because of a place you’ve visited? There are so many ways a name can be chosen. Science suggests that what you name a child can have lasting impact on their life. Kids can be made fun of. Statistics show that names can play a roll in your strengths and weaknesses in jobs. Names can affect people as to their thoughts of you the first time you say your name to them. There are so many ways to choose a name. Now days at the touch of a button we can have a glimpse at thousands of names. I found that when I had my own children even when I looked in a book or on the internet there were so many names that jumped out at me and I loved them all. Today, anything goes! You can literally look at a fruit and name your child Apple. You can hear a name in a song. Your Dad or Grandfather could have an amazing name. You might love a President, Movie Star, Philanthropist, Athlete or maybe a flower. Have you traveled to some place you just love and think that name would be amazing? Whatever you pick just ask yourself this one question. What’s in a name? Does a name stick out to you? Is a name calling to you somehow? Do you believe your baby already has a personality in your womb and you know their name? 1. My husband and I wrote down all the boy and girl names we loved. We gathered our names from books (our daughter was born before surfing the internet,) people or things that have influenced our lives, family names we felt strongly about and religious connections. 2. We then picked our top 3-5 for each gender. 3. We pondered and prayed on the names we chose for a few months. All of our kids have first and middle names that are combined from both my husband and I’s top picks. 4. We chose the name. This is where our story differs just a little bit. When we found out our first child was going to be a girl we narrowed down our names and just couldn’t decide. A few weeks before she was born we were still torn so we made the choice to decide after we saw what she looked like. With our two sons their names were firmly chosen a few weeks before they were born. Whichever way you choose your child’s name know this: you are inherently aware and connected to this special little being before they arrive. Take the time to choose a name in which you FEEL deeply connects to that sweet little spirit who is about to join your family.Use the resources you like to find the name. The options are endless. 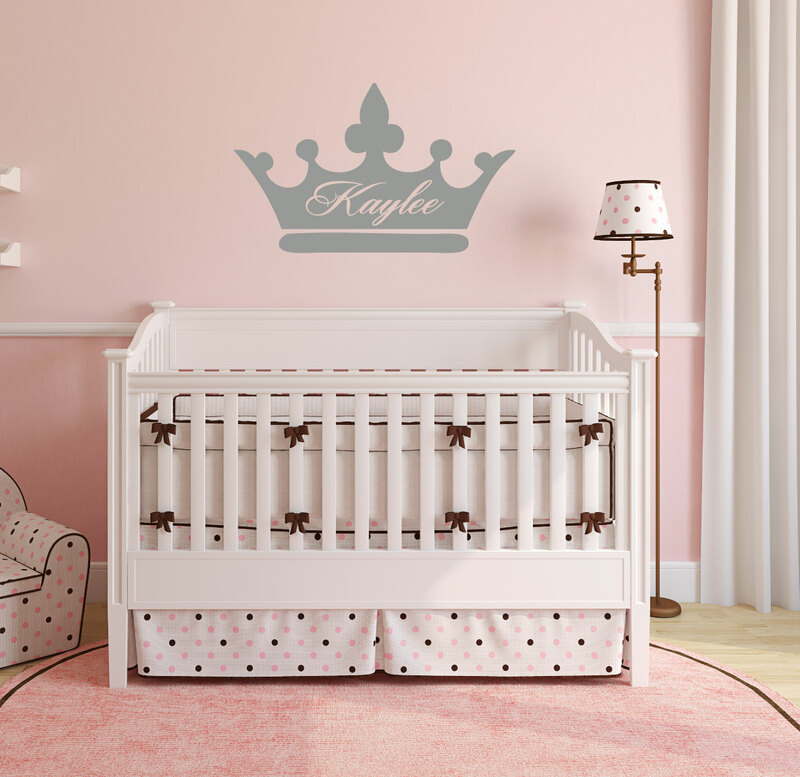 Whatever name you choose for your sweet bundle of joy will be the right fit for your child. At CustomVinylDecor.com we love designing cute vinyl decals that will look great on your window or wall. We specialize in personalized decals and product customization. So, if you don't see what you want, let us know and we will see what we can create for you. We hope you enjoy your shopping experience with CustomVinylDecor.com.